Real-Life Time Management for the Claims Adjuster A practical, full day (8:00am - 5:00pm) workshop which includes real-life scenarios geared specifically toward the claims adjuster. Adjusters use their own issues and barriers in problem solving exercises to focus on result oriented activities. Students leave with some very practical methods of improving time management, which they can put into place right away, as well as some methods that require management support and involvement. Customer service is strongly emphasized throughout the day. The 8 Characteristics of the Awesome Claims Adjuster A full day (8:00am - 5:00pm) workshop designed to heighten the awareness of the characteristics which are the trademark of truly exceptional adjusters (Attitude, Initiative, Customer Service, Teamwork, Desire for Excellence, etc.). Students are involved during the day in group discussions, role-play, team exercises and self-evaluations. Throughout the day, each student is required to develop an action plan which includes changes they are actually going to make in order to enhance the area they identify as needing the most improvement. Important note: This is not a class to correct performance problems. This is intended for already solid performers who wish to become superior. Conflict Resolution for the Claims Adjuster Staying effective during unpleasant situations is the hallmark of the most successful adjusters. The main objectives of this course are to explain the psychology that governs upset customer behavior, suggest steps to take after the customer is gone, present strategies for successful customer encounters, and advise adjusters about their actions and attitudes. . . 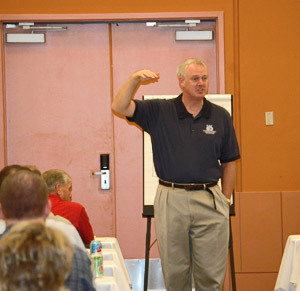 Upon the completion of the course, adjusters will have learned: why it's important to calm upset customers; why we sometimes want customers to complain; things we can learn from upset customers; why customers become upset (not the obvious, such as low offers); what we can do to avoid customers getting upset; how the words we use make a difference; what the upset customer wants; how to diffuse defensiveness; and what to do after the encounter is over. Awesome Claims Customer Service I A full day (8:00am - 5:00pm) workshop for any level of claims professional. Most claims people know the customer rarely recognizes outstanding customer service during the claims process because they are so worried about the outcome. Because of this, it is extremely important for claims professionals to be able to recognize and deliver outstanding customer service without the acknowledgment of the customer along the way. In this course, participants will understand the basics of providing high quality customer service, learn proper telephone techniques, gain insight into understanding what individual customers need, manage the customer's perception, as well as understand the essential role customer service plays in the success of the claims department. Some specific topics include: handling the telephone; effective listening; managing objections; asking questions; delivering bad news; managing different customer behaviors; managing the voice mail system; managing customer call backs; statements to avoid; closing conversations; attitude as the key to success; and an action plan for better service. Awesome Claims Customer Service II A full day workshop (8:00am - 5:00pm) intended as a direct follow up to the Awesome Claims Customer Service Part I. It is intended to build upon the basic customer service building blocks previously set down and develop new high level customer service techniques to improve results. In part 1, focus was mainly on the interaction with the customer. In part 2, focus is mostly on the claims people themselves. Claims people are taught: to understand stress factors in the claims position in order to better deal with stress in the claims environment, as well as to identify and eliminate self-induced stress; to install a sense of responsibility for one's own development and foster initiative; to identify and eliminate things that claims people do that cause unnecessary work; to develop a strong sense of prioritization and ability to focus on high impact activities (low time, high results); to understand a customer's reactions to demands and incorporate them into file resolution and to identify common survey results and comments, and look for ways to improve results. Managing the Telephone A full day workshop (8:00am - 5:00pm) dedicated solely to skills and techniques in managing the telephone effectively. This is especially crucial for the telephone claims adjuster, who needs to both increase the levels of customer satisfaction and decrease the actual time spent on the telephone. Many adjusters do not recognize that they themselves contribute to the telephone being the biggest interruption in their day. The goal of this course is to teach adjusters how to be more time-efficient on the phone, and how to eliminate those calls being generated as a result of how the adjuster answers questions and explains the claims process. Students also learn the right way to instill a high level of confidence in the customer which leads to less phone calls. Attitude and Initiative Training for the Claims Adjuster A full day workshop (8:00am - 5:00pm) designed specifically for adjusters in the two most important attributes of superior adjusters. Attitude and initiative are often results of past life experiences and not training. This workshop focuses on steps the students can actually take on their own to improve their own attitude and initiative. Managers across the country agree that adjusters with positive attitudes and strong initiatives are indispensable in the office and are usually highly effective and highly successful adjusters. These attributes cannot be forced upon anyone, but they can be taught to be willing participants interested in improving themselves in these areas. Empathy and Listening Skills A full day workshop (8:00am - 5:00pm) designed specifically to improve communication by enhancing listening skills and developing empathy abilities. It has been said that the ability to listen and empathize with a customer is 70% of ultimately solving any problem that can arise. Practice exercises, role plays and real life scenarios are utilized in this highly interactive, practice based workshop. It will improve listening skills and result in both an increase in customer satisfaction and decreased effort. This course will help the student learn how to expand their listening abilities and become a more effective communicator. It will teach how to take in greater amounts of information, and remember more while "hearing between the lines." Adjuster Organization - Managing the Desk A 1/2 day workshop designed specifically to address organizational skills and desk organization for the claims adjuster. Subjects include proper ways to handle diary, mail and telephone calls, as well as organizing a desk in a way that supplements claim handling efficiency. The goal of this workshop is to improve adjuster efficiency through the use of proper desk management and organizational process. Prepare for Promotion - Adjuster Leadership Training A full day workshop (8:00am - 5:00pm) designed specifically for the claims adjuster who wishes to prepare himself/herself for promotion. Adjusters often focus solely on the technical aspect of the job responsibilities and lose sight of the many factors that come into play when selections for management need to be made. Students learn how to improve the skills that will be recognized when promotional opportunities arise and avoid the many mistakes some adjusters make when looking for promotional opportunities. The goal of this class is to develop an action plan for increasing the opportunities for promotion. Teamwork Basics - No Adjuster is an Island A full day workshop (8:00am - 5:00pm) designed to enhance teamwork among members of a unit or group. Many members of a group feel it is the manager's responsibility of the group to develop teamwork. That is only half true. The other half is that it is the responsibility of each of the team members to also do what he/she can to enhance the teamwork within the group. This workshop focuses on things that each member of the team can do to enhance teamwork of the entire unit or group, and improve efficiency for all members of the team. The goal of this workshop is to not only openly display the benefits of teamwork, but also to introduce and practice skills each member can put into place. Interpersonal Skills - Improving Team Member Relations A full day workshop (8:00am - 5:00pm) dealing with the many factors (influence, resources, information, etc.) that come into play in team relationships. This workshop includes how to effectively communicate in order to complete what needs to be done, and discusses why team relationships can be difficult. Furthermore, it addresses how to effectively negotiate and convince team members to successfully meet the group's objectives and responsibilities. Effective Recorded Statements A full day workshop (8:00am - 5:00pm) designed to increase the effectiveness of recorded statements being taken. Practice scenarios and role-plays are utilized throughout the day to increase effectiveness in one of the most important evidence preserving functions performed by the claims adjuster. The goal of the course is to increase the effectiveness of recorded statements by developing proper outlining and strategy skills. Business Writing Skills for Adjusters A 1/2 day workshop designed to help adjusters develop the ability to write clear, concise business letters, memos, file notes and reports. This includes the "do's and don'ts" that will help communication be more persuasive. The elements to well-written sentences and organized thoughts are covered in detail. This is especially important in the adjuster position since quite often it is the adjuster's letter that is used as a tool in the developing stages of claims handling. The goal of this workshop is to enhance the level of business writing for the adjuster in the areas of professionalism and persuasiveness. Beating Anxiety and Dealing with Anger -Help for the New Adjuster A 1/2 day seminar designed specifically for the new claims adjuster that might be experiencing high levels of anxiety due to the stress and pressures of the claims adjuster position. Scenarios, exercises and role-play help develop ways of increasing self-confidence, resolving anger, as well as understanding, evaluating and reducing anxiety. This course will also help adjusters learn how to manage their frustration as well as the frustration of others. Through focusing on the causes and effects of anger, adjusters learn to modify their behavior and their reactions, thereby increasing efficiency and customer service while enhancing job satisfaction. Negotiating with Attorneys for Claims Adjusters A full day (8:30am - 4:30pm) interactive class that focuses exclusively on the techniques needed to effectively negotiate claim settlements with attorneys. Students learn how to put themselves in the best position for a confident and strategic negotiation by building a solid foundation of knowledge and planning. Some of the foundation strategies include researching the attorney, the claimant, the injury, the liability, the venue, etc. While the knowledge building starts immediately upon receipt of the claim, it doesn't stop until the settlement check has been cashed and the signed release has been received. Identify & utilize leverage points that most people don't recognize. Identify time constraints on all parties. Identify risks inherent to the failure to settle. Listen for points that support the target settlement. Identify the strengths of the case and how to leverage them. Identify the weaknesses of the case and how to respond to them. Recognize areas that need clarification. Confirm areas that are in agreement. Know the right person with whom to negotiate. Pinpoint the negotiation style of the attorney and how to respond effectively. Get the attorney to negotiate from a realistic starting point. Continue the negotiation after receiving a firm or final demand. Assess the mathematical probability risk. Get the most benefit from arbitrations and mediations. The goal of this class is to teach techniques that will result in settling claims more expeditiously and accurately. Negotiating with Body Shops A full day (8:00am - 5:00pm) workshop designed to help improve discussions with repair facilities. This is for Estimators, Appraisers, Claims Adjusters, or anyone who deals with body shop personnel. Using many of the same basic negotiating techniques that can be found in the Negotiation Training for the Claims Adjuster class, this course uses case studies and scenarios that are specific to the issues that arise when dealing with auto repair shops. Critical Thinking A full day workshop designed to teach not only the benefits of critical thinking, but how to put critical thinking to work when making decisions. Claims people are taught how to: make good decisions based on cautious review; work through problems to find the best answer; stay focused on the real issues; and apply critical thinking to writing.